Bundesliga | FC Ingolstadt 04: Here to stay! FC Ingolstadt 04: Here to stay! Ingolstadt - "Unbelievable! I'm bursting with emotion! We're in the Bundesliga - it's going to be amazing!" FC Ingolstadt 04 captain Marvin Matip was in jubilant mood after his side crowned a sensational 2014/15 with promotion. bundesliga.com reveals why we can all look forward to the German top flight's newest and 54th all-time member. It was already clear even as last season was barely weeks old that Ingolstadt were going to be a force to be reckoned with. Coach Ralph Hasenhüttl’s charges may have only drawn their opening two games but had shown plenty of glimpses of their quality and immense potential. The 2-0 defeat of SpVgg Greuther Fürth on Matchday 3 was the start of an impressive run in which die Schanzer only lost once during the entire first half of the season and went into the winter break as runaway leaders. A potent mixture of defensive stability, uncompromising counter-attacking play and an aggressive style of pressing removed any lingering doubts that Hasenhüttl’s side had what it takes. The stated aim for the season of survival was quickly revised and the focus switched to gaining promotion. "Into the top flight within 11 years!" says this tweet from the official FC Ingolstadt account. At the turn of the year, however, the Ingolstadt engine started spluttering. The team had been able to throw caution to the wind before the winter break, but as expectations increased, the nerves crept in. In what threatened to become a difficult situation, the club’s officials showed qualities that could prove invaluable next season - keeping their composure and encouraging the players to remain focused on their own strengths. The plan worked. Of course, the foundations of success weren’t only tactical maturity and team spirit. FCI profited from the consistency of three top performers. The captain and central defender won more challenges than any other player in the Bundesliga 2 and also posed a genuine threat going forward. He recorded a pass completion rate of almost 80 per cent and weighed in with three goals and an assist. The Brazilian is a real midfield terrier who rarely loses the ball. The fact he was the most fouled player in the league speaks volumes for his tenacity. The midfield playmaker had an extraordinary season. In four previous Bundesliga 2 campaigns combined, he had only been involved in 15 goals. Last year he had a hand in 23 (seven goals, 16 assists). What’s more, he covered every blade of grass, running an average 11.8 km per game and having more touches than any other player in the league. Just a year-and-a-half ago, Ingolstadt were bottom of the league, having picked up a solitary point from the opening ten games of the 2013/14 season. Cometh the hour, cometh Hasenhüttl. The Austrian introduced a style of play that purists would describe as counter-attacking, but there is much more to it than that. Ingolstadt's style is a hybrid brand of aggressive pressing a la Borussia Dortmund and devastating breaks along the lines of Borussia Mönchengladbach. Little wonder then, that the 47-year-old’s contract was extended until 2017. Ingolstadt have done their homework. The infrastructure, officials and heartbeat of the club - the team - are all Bundesliga standard. Top performers such as Alfredo Morales, Roger and Tobias Levels have already extended their contracts, while Romain Bregerie has signed from fellow new boys SV Darmstadt 98. All the signs point towards the ambitious club striving to remain in the Bundesliga for the long-term. FC Bayern München, Dortmund and the rest will have to prepare to face a very difficult opponent. The tactical masterplan that was carried out to near perfection in Bundesliga 2 is likely to succeed against many teams in the top flight as well. 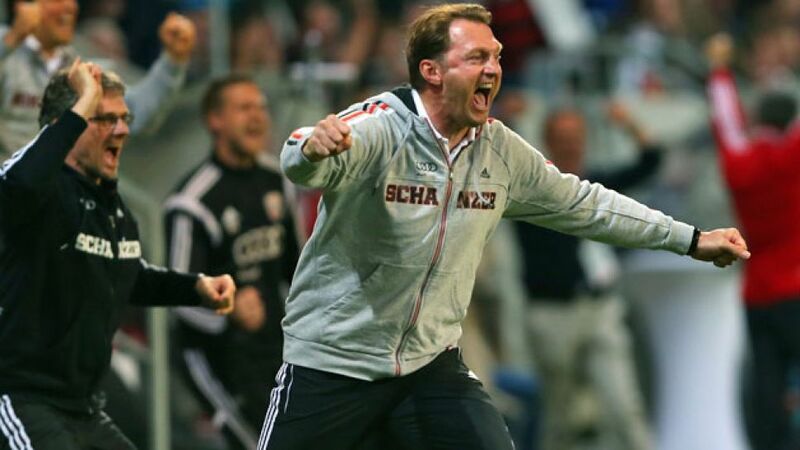 Ingolstadt are poised to set the Bundesliga alight.